'Lands End' was demolished this weekend, click HERE to read about it on CBS News. Click HERE for more on 'Lands End'. Photo from CBS News. 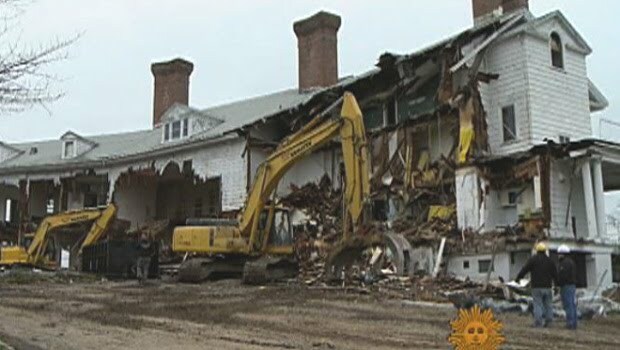 I watched sadly the grand old lady torn down with little fanfare on CBS's Morning program. It truly was irksome to see the owner still portray the circumstances as beyond his control - and the media accepting it at face value. I would've thought more of the structure could've been salvaged vs. outright demolition. One assumes the columns were of solid word. The arched windows, dormers, and even the brick work .. that could've been reused. In fact reused as salvaged building materials with pride. It just seems all the more a waste. I've felt somewhat ambivalent to this property until I saw the preview this morning on CBS's Sunday Morning. Hearing the wood crack as I saw the walls come down - my heart just started racing - ambivalence to apprehension! Kudos to CBS and the reporter for airing this story about the demo so quickly on National TV. I wanted to slap the smile off that guys face! Rest assured, many of those priceless architectural salvage pieces wil soon turn up on the open market ––– Brodsky stripped them out long before he exposed the house to the elements. But it is a shame he couldn't salvage that wonderful mural. Security word - nestics: the domestic science of converting the kids' rooms into a "craft" space. Trust interested readers viewed the CBS video. If not, click below and push the bar along to 5:22 to get a look at what will be built on the property now that Lands End is taken down, a development named "Seagate" will follow. The Gatsby association interested me far less than the simple lack of ostentation about this house. Not that attempts at up-fluffing the place didn't leave their mark over the years but, originally, the place seemed like a rambling family "camp" to me, hence my attraction. So be it. Glad its over so I can abandon all hope. I agree with Kellsboro Jack. For the first few moments in the CBS piece, I thought the owner was some preservation leader instead of the person who is responsible for tearing this building down! The Newsday pictures show the gatehouse completely leveled. Zach - thanks for the salvage link! Just $10.5k (asking) for the staircase actually seems like a great bargain. Sadly that salvage place has items from La Ronda (Main Line) which is another lost gem whose new owners boil my blood. I never heard anything about a mural... what was it of? I love how the owners stated over and over again that the house was not a Stanford White yet they say it was in the listing for the stair case. Gee, judging by his rough around the edges accent, it doesn't surprise me that Brodsky would name the new development after a neighborhood in Brooklyn. Fasten your seat belts.... dreadful things are about to happen in Sands Point! Amusing to see in the staircase advert that it has been backdated to 1902 to accommodate a Stanford White attribution (old mis-attributions die hard?). "I never heard anything about a mural... what was it of?" I think the mural reference might be the hand-painted wallpaper in the dining room. One of the video clips shows a former owner making note of the rarity of the wallpaper she'd had installed. I love that wallpaper. you can see a little bit of it in the staircase link.... Im sure they were able to salvage it. I'd love to see it now. I dont think any of Jen Ross' photos featured it. "A very beautiful antique Chinese paper to be exact." well firefoxs system didn't like my comment or is owned by brodsky as it xxxxed the whole thing. i'll try again. i thought that whole video was the most gag inducing thing i've ever seen. what a supercilious little piece of crap that guy is. hopefully, lands end will be reincarnated as a beautiful woman who marries brodsky and takes him for every penny. i'm just sad there's no Hell cause if anyone deserves eternal punishment, this low life piece of slime is it. i'm glad they saved some stuff but it's too bad he's the one making the profit instead of SPLIA. i'm packaging up a little present my cats prepared and sending it to him right now. So sad to see the place go. I have lived in PW all my life and sailed past that house more times than I can remember. Always new I was getting close to home when you could see the columns on the portico. ^ The legend is that Lands End was the inspiration for the Buchanan house and Beacon Towers was the inspiration for Gatsbys. But good luck finding some hard evidence of that. "what a supercilious little piece of crap that guy is"
He must be blooming with power today; if he ever had a grudge against the old guard, he's sure gotten even on a grand scale. What a scheme: demolish the ultimate, enduring old guard symbol and replace it with Coney Island [he even named his &#$@! development after one at/near Coney Island]. There are many who claim that Beacon Towers and Lands End where not the inspirations for Fitzgerald, but if you read the book, Beacon Towers really fits the bill, and even though it was built by Alva Vanderbilt Belmont, who by the time she built it would have been considered Old Guard. It really looked like something a new millionaire would have built. Lands End by comparison, represented an elegant simplicity that someone like Daisy Buchanan would have lived in. Some houses like Beacon Towers, it is understandable that if it still survived might be considered uninhabitable in today's lifestyle, but Lands End, if it had been updated, would have been the plum mansion. Just imagine when sailing in your yacht and someone asked, where's your house? And you answered, the big one over there. You can't miss it! I really loved this place from the sea when fishing around the port. You could see the pool out front with the large 4 collums holding up the massive portico. I walked the property soon before it was pulled down. The collums were rotted and i could see there was a large 10x10 timber in side. The racoons were running all over the place.I was fishing from shore that night and you could here the party going on in side the house. I could imagine the furry gang as a scene from Gatsby. I must say the loss is substantial but the National Historical Society didn't seem to find it something they wre willing to rescue. So lets all take a breath and find ways to help the next Old Tale Home from the same demise.